Danco Electrical Contractors of Raleigh is experienced in commercial generator installation and maintenance to keep your business operational during power outages due to unforeseen circumstances. Power outages can result from inclement weather, construction error or simply an aging transformer, but keeping your vital electrical systems operational in a commercial setting is essential. Today’s businesses have a host of critical power, computer, and telephone systems that often require emergency generator backup to remain operational during power outages and emergencies. A commercial generator can ensure that your security, refrigeration, lighting, heating and communications remain intact when a power outage arises. 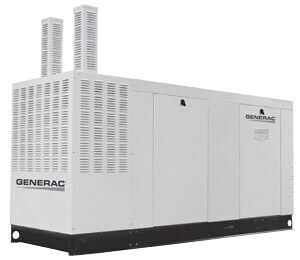 When it comes to generator consultation and installation, Danco Electrical Contractors of Raleigh is a certified Generac Generators dealer and can guide you in finding a generator that best suites your commercial needs. Generac is a widely recognized leader in electrical generator technology and reliability, and our commercial installations ensure all power cutover and modulation provides clean power to critical business systems. With this piece of quality, safeguard machinery and the correct installation, power generation is automatically transferred to the commercial generator, and a service entrance breaker protects the internal breakers from power surges due to this transfer. Our industrial and commercial installations ensure all power cutover and modulation provides clean power to critical business systems. For information concerning the right generator for your commercial business, contact us today.